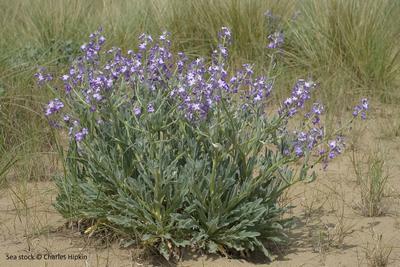 Sea stock is an attractive plant found in sand dunes. It has a grey down over the leaves and stem, beautifully complementing the pale lilac flowers which can be seen from June to August. It is associated with mobile dunes, particularly in communities with Marram grass, Sea holly and Sea bindweed. The numbers of plants fluctuate greatly between years but there are several known populations between Bridgend and the Gower. It was thought extinct in Glamorgan in 1848 but was found again at Crymlyn Burrows in 1964. For more information see the Online Atlas of the British & Irish Flora Sea Stock page.